The transformation of the railway terminals in the new districts will take place in a way that mirrors the slow rhythms of change that the city undergoes. The railway sites are characterized as urban voids which are not immediately accessible; remediation and transformation of them will take years. 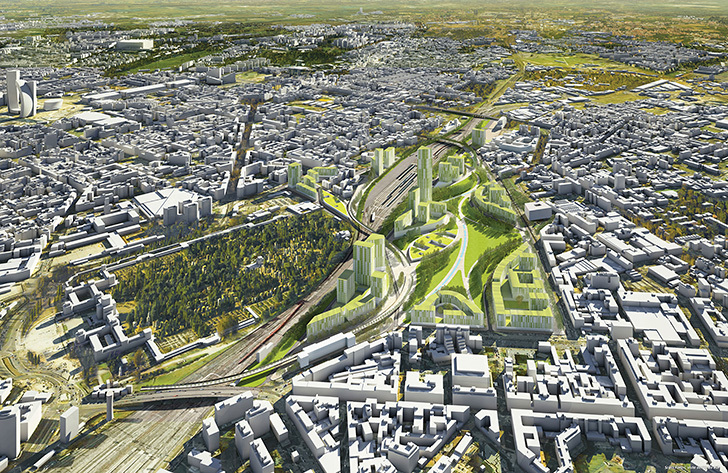 The proposal of immediately opening the whole site to the public is simply not feasible. It is therefore necessary to invent a strategy for envisaging the opening and uses for the new districts and at the same time conceive natural engineering techniques at the service of the city. Our intent is to use the long lead times of the urban project as a resource. We are inspired by the agricultural techniques of field drainage and irrigation, typical of the Po Valley to imagine a water collection system that structures the sites where future district will rise and identifies parcels. As traditionally happens in the Po Valley, the water collection system corresponds to the network of paths, which provides an access to the sites in the very first phase of the project. The result is a parcels pattern which are concerned by remediation processes and creation of fertile soil through a technical work of natural engineering. A gradual substitution process is implemented. Progressively tree plantations replace old buildings and the last traces of railway services. This process, following and adapting itself to the times of the sites transformation, gives the opportunity to prepare and anticipate developments. As a result, we propose a transformation that gives immediate quality to the sites as long as necessary for the construction of the districts. In the temporary phases some paths can be equipped with Belvedere that will serve as observation points of the transformations. The garden serves as the privileged observatory upon the new districts construction site of the new districts. 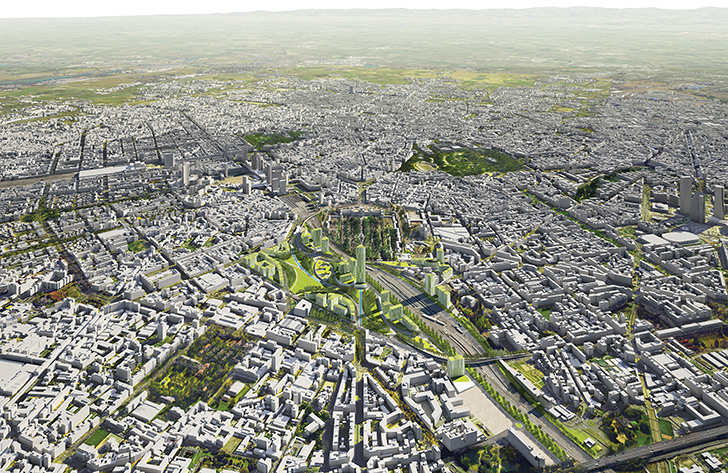 The landscape long-term design of future district, is structured on the "artificial geography" of train network. In the case of the railway terminals Farini and Lambrate, the curvilinear rows of trees, follow the orientation of the old railway tracks and put into play the memory of the place. The rows of trees, planted at irregular intervals, function like a backdrop, creating a "landscape of backdrop". In keeping with the orientation of the railways tracks, this backdrop fluidly directs views and organizes paths, establishing the link of the future district with the history of the place. This peculiar planting system becomes the distinctive character of the site. The directionality of tree plantations and his arrangement in following backdrops, allow a prospective succession with different depths of field. The tree rows evoke those of the Lombardy countryside and follow the traces of water management. In the case of Porta Romana, the tree-lined backdrops has a clear orientation that, while carrying out the railway track directionality, keeps its linearity bringing out a more geometric composition.